This photo – printed as a postcard – was taken in Scarborough, in August 1932. Helpfully, someone has written this on the back. It was taken by ‘North Bay Snaps’, who were clearly very active at the time – many of their photos/postcards are still around, many for sale on Ebay. It’s just one of a large collection, a few of which I’ve been pinning on YorkStories at historypin.com. A year or so ago my mother gave me a box of photo albums she’d bought at car boot sales in and around York. She wondered if I could use the internet’s impressive powers to find out more about them, maybe locate people related to the compilers of the albums. Even more years back I investigated our own family history, and found it absorbing and enlightening in many ways, but also a bit depressing. Not good perhaps to spend too long in the past. When I first looked through this box of other people’s family photos I felt totally overwhelmed, put the lid back on and put it in a corner of the ‘home office’. It perhaps needed a little longer for me to recover from my somewhat obsessive searches regarding my own ancestors. Recently, after adding content to historypin.com, the box of photos came to mind again, and I felt slightly guilty that I hadn’t done anything about them. So now I’m adding the ones I can. I’ve had several attempts at ‘excavation’ of the box and its albums. Several family histories are in there. Also many, many photos which can’t be attached to a particular family history, but have a faded beauty and charm as they stand. None of them are York related. There’s a Yorkshire connection with many of them, but to Hull, Leeds, Bridlington, Dronfield. There’s also a New Zealand connection. See my historypin pages and my flickr.com photos for more. By Lisa @YorkStories • 30 March 2012 Beyond York, Histories To link to this page's proper location please use the > permalink. The world was a very different place just a few years after this happy group were immortalised. 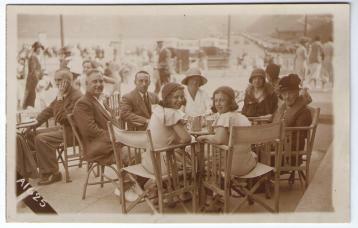 I once had a postcard of a family at Southport sands,Lancashire taken in the summer before The Great War..What fate lay in store for the happy lads in their cricket slipovers and boaters?? ?.